When light begins to fade, an LED flashes. 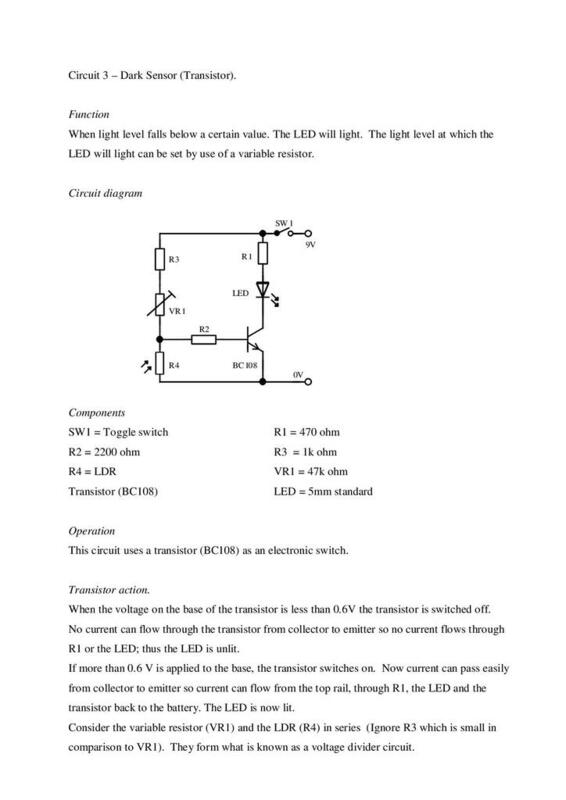 The level of light at which the LED begins to flash can be set by use of a variable resistor. 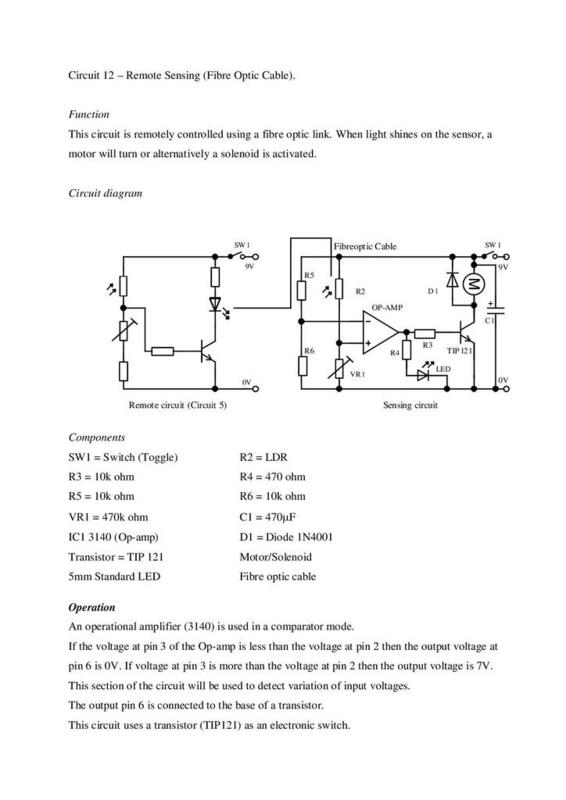 When sunlight becomes too bright the circuit will switch on a motor that will draw the curtains. In the absence of sunlight, curtains are reopened. When light level falls below a certain value. 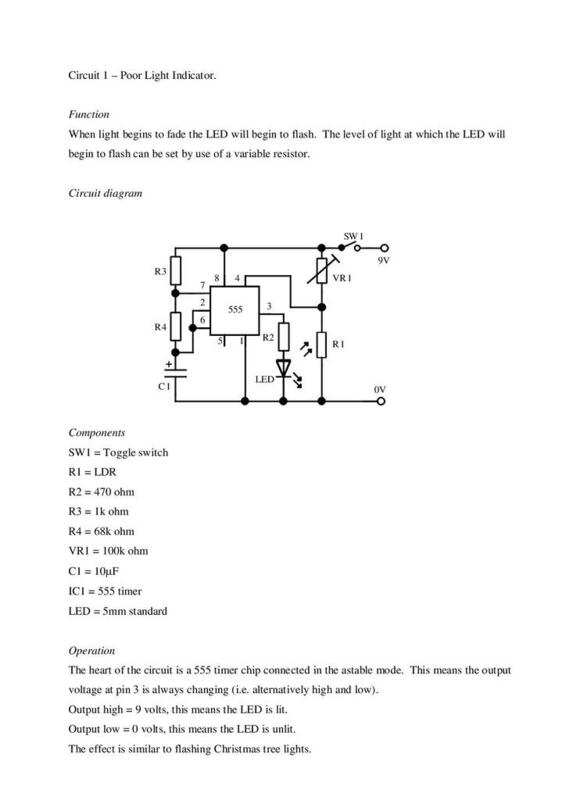 An LED will light. 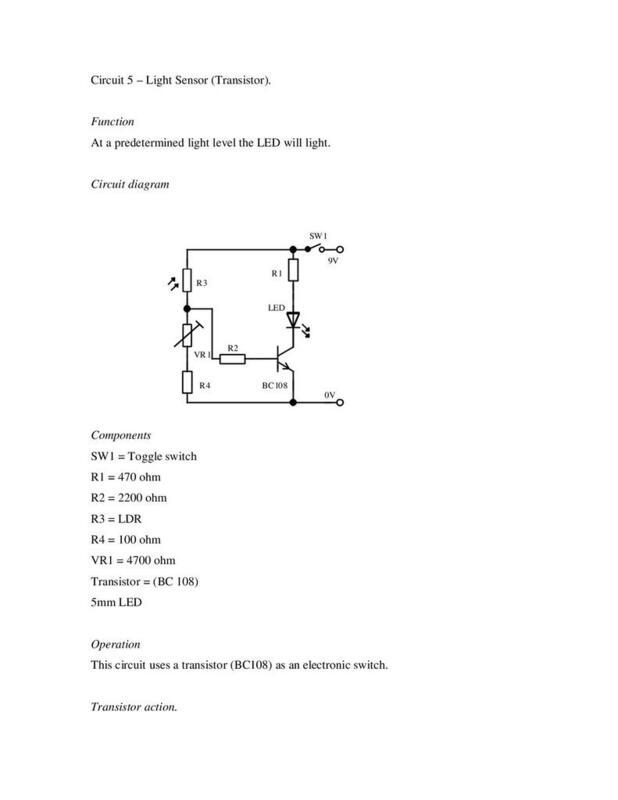 The light level at which the LED will light can be set by use of a variable resistor. When light level falls below a certain level, an LED lights. 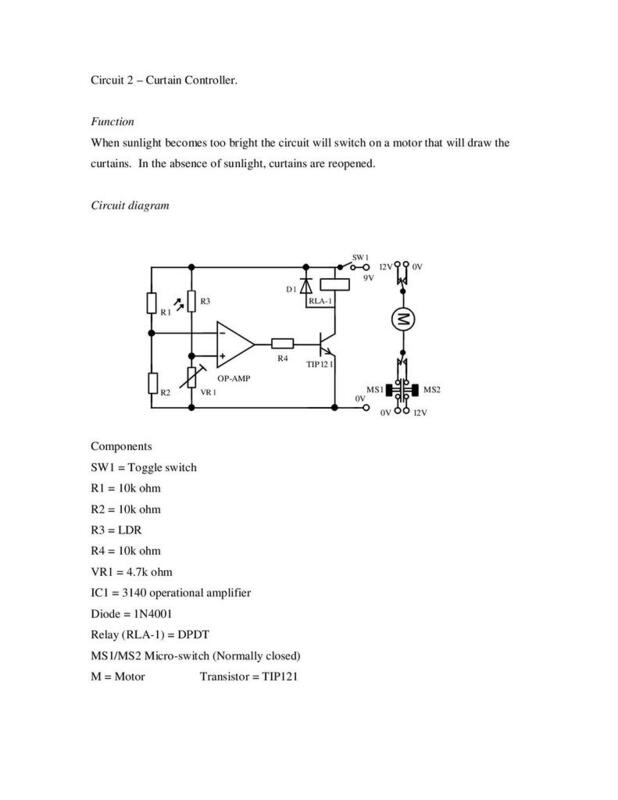 The light level at which the LED will light can be set by use of a variable resistor. 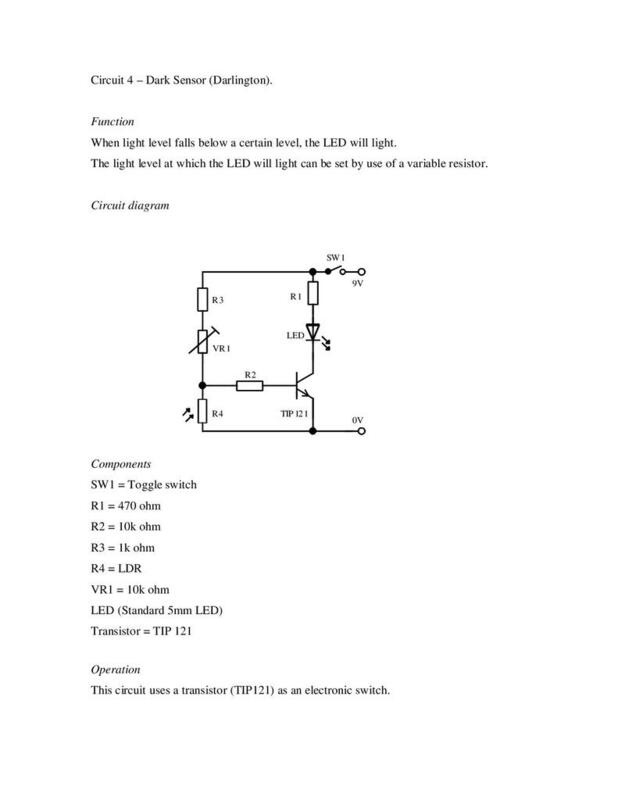 At a predetermined light level an LED will light. At a particular light level a buzzer sounds. In dark conditions an LED lights. 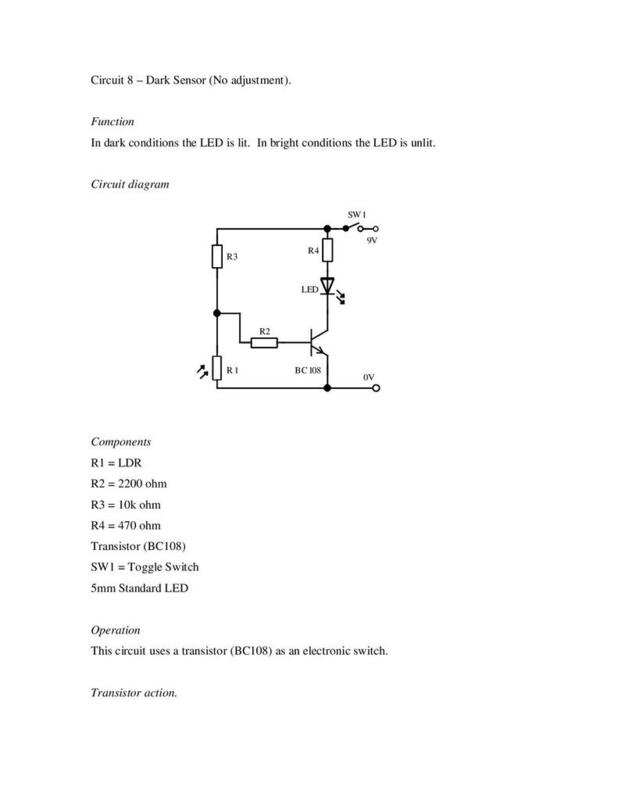 In bright conditions the LED is unlit. 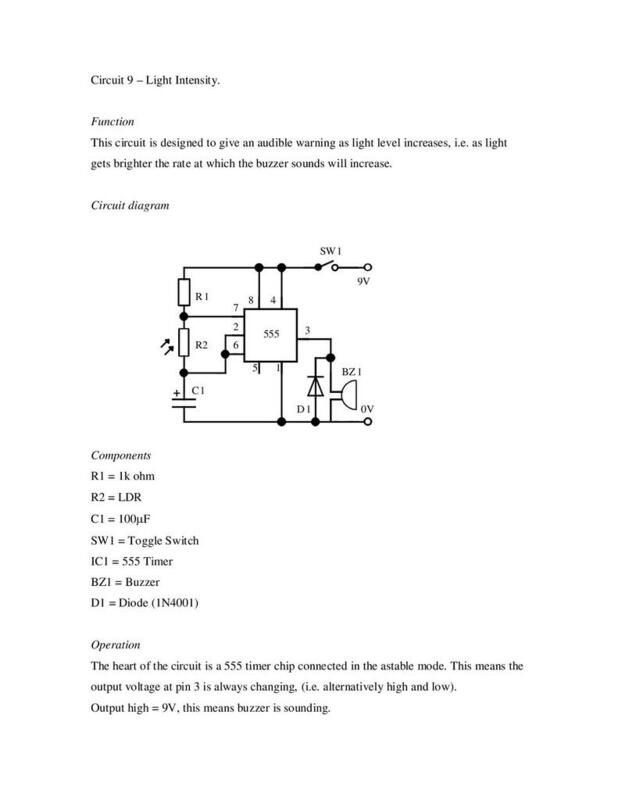 This circuit is designed to give an audible warning as light level increases. As light gets brighter the rate at which the buzzer sounds will increase. 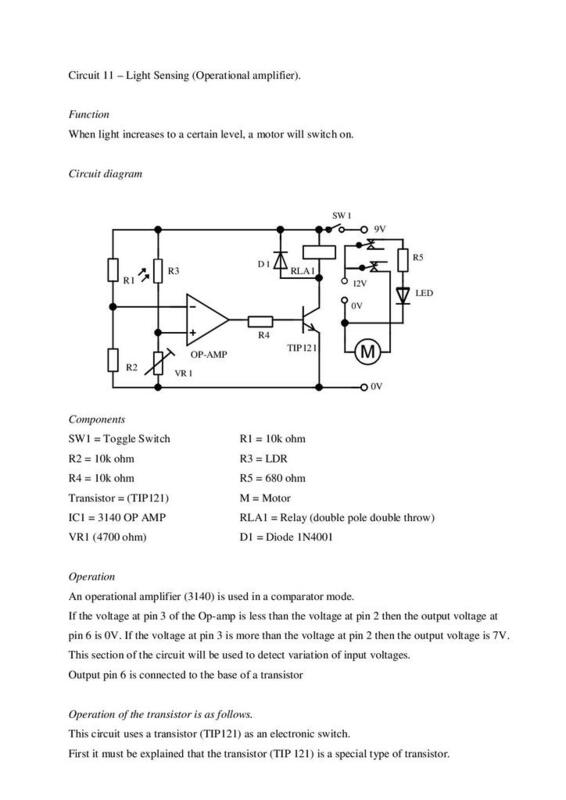 When light increases to a certain level, a motor switches on. 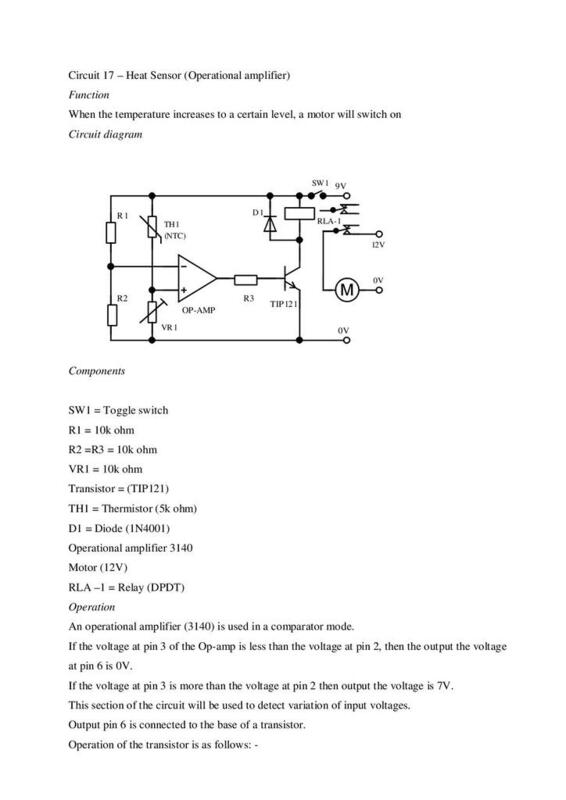 This circuit is remotely controlled using a fibre optic link. 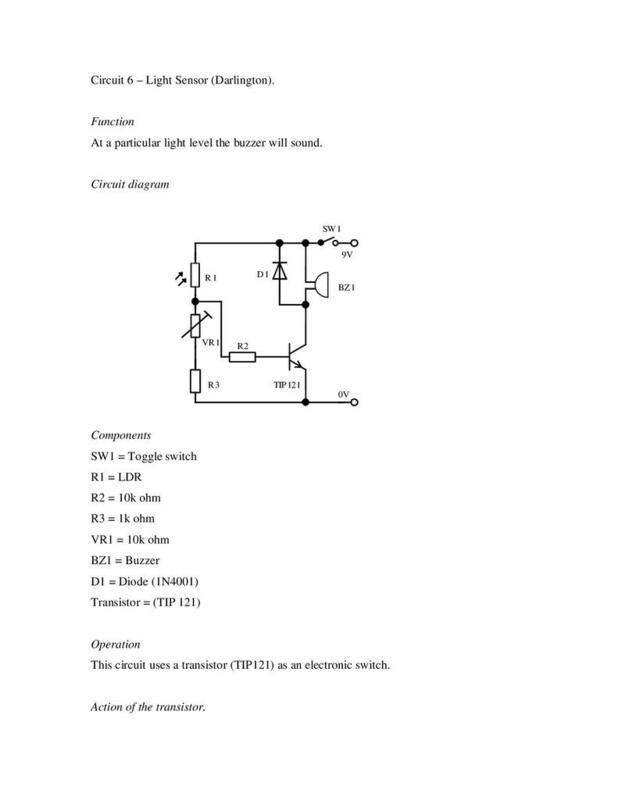 When light shines on the sensor, a motor will turn or alternatively a solenoid is activated. 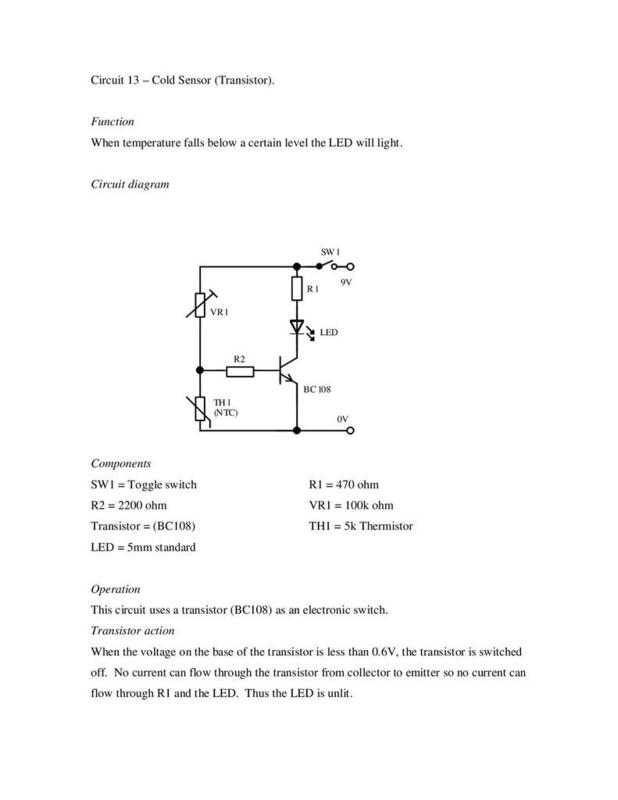 When temperature falls below a certain level, an LED will light. When the temperature falls below a certain level, an LED lights. 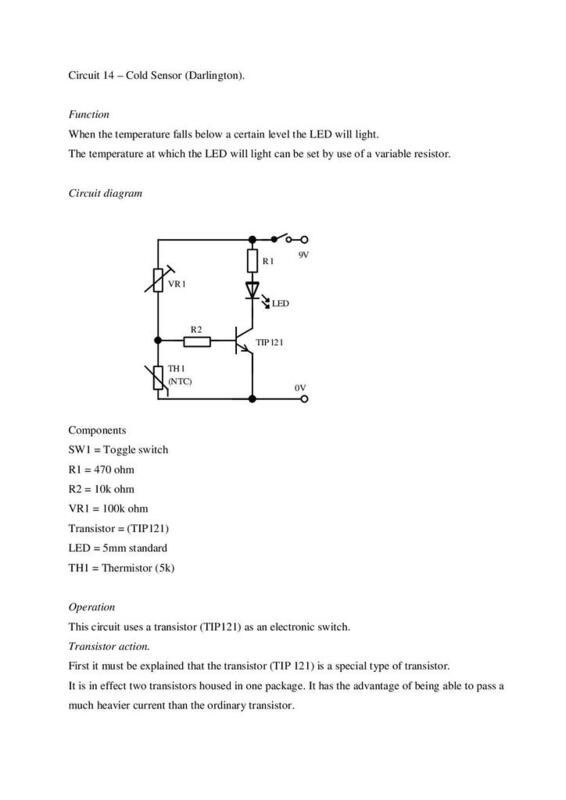 The temperature at which the LED will light can be set by use of a variable resistor. 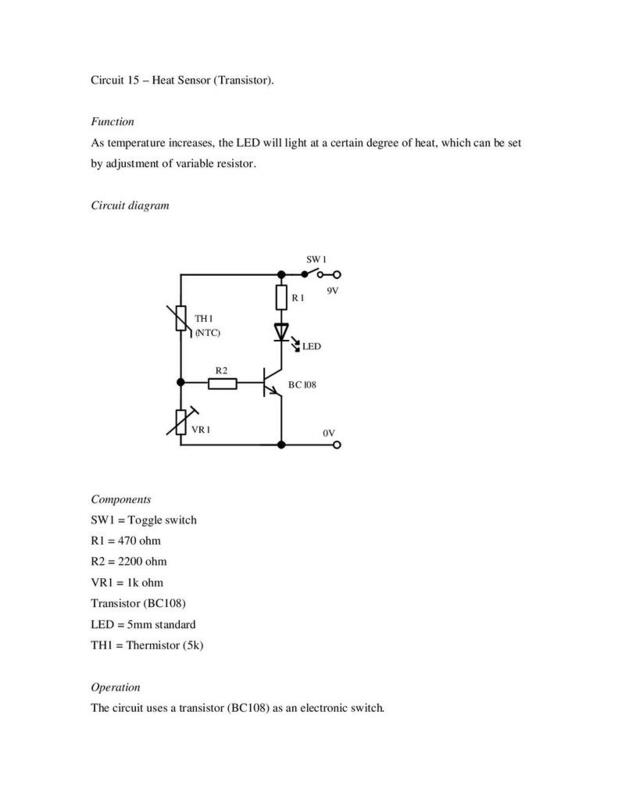 As temperature increases, an LED lights at a certain level, which can be set by adjustment of variable resistor. 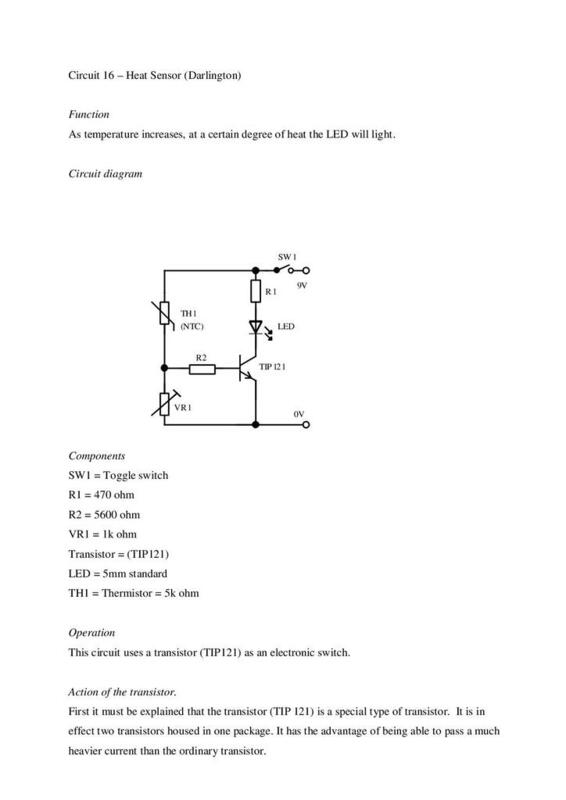 As temperature increases, at a certain degree of heat the LED will light. When the temperature increases to a certain level, a motor switches on.